If it doesn't budge at all I recommend covering both pins and the front sight block in break free and let it sit for a few hours. Knocking out the pins is the hardest part, so it might take a little while. If after both hammering away and soaking in break free you still cannot get them to budge try the follow. 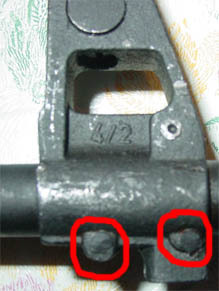 When the Front Sight Block is loose enough to be moved left or right set it to the position you want, obviously if it is canted you want to set it straight. When you have it where you want it, lay the rifle on either side and get some one or some thing to hold the front sight block exactly where you wanted it. Now take your 1/8th diameter rod and cut off two pieces .50 inches in length. Put a tiny bit lubricant down the re-drilled holes. Grab your hammer and lightly tap the piece into the drilled holes. Once they get close enough to the bottom of the rifle base use your pin punch to finish the job.